Lawrence and Lee’s 1955 Broadway drama has been revived as part of the Charles Darwin anniversary celebrations. It is 200 years since Darwin’s birth and 150 years since the publication of his still controversial work ‘ The Origin of the Species.’ The play deals with the famous 1925 Scopes ‘Monkey Trial’ when Tennessee schoolteacher, John Scopes, was put on trial for violating state law by teaching Darwin’s theory in his classroom. The trial became a major media event in the U.S.A. at the time not least because it was the first trial ever to be broadcast by the new wonder of the radio through a coast – to – coast radio station hook up. Though oft performed in the U.S. this large cast Broadway warhorse has never been revived in London since its first scaled down production at the St Martin’s Theatre in the late 50’s. In the hands of director Trevor Nunn, the play proves highly durable, entertaining and engrossing. It also remains highly topical as it pits religious fundamentalism against freedom of thought, let alone freedom of speech. Indeed, there is currently a debate as to whether Creationism, Darwinism’s opposite, should be taught alongside it in UK schools. 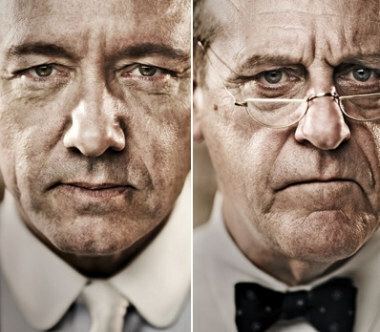 As it is also a courtroom drama, it gives Kevin Spacey (as Henry Drummond for the defense) and David Troughton (as Harrison Brady for the prosecution) the opportunity to turn in two magnetic performances and to deftly spar against each other, not least when the Prosecution takes the witness chair to be cross examined by the Defense. By their sheer physicality both actors embody their role’s attitudes: Troughton loud and bloated in the smug religious narrow mindedness that he represents and Spacey ambles and shambles around the courthouse, leaning forward and with arms dangling like the ancient simian that Darwin asserts Man has derived from. Their sparring is a delight and reveals two actors at the top of their game. As Drummond, Spacey is breathtaking in his passion for the truth and freedom of thought, his intense conviction beautifully contrasting with his tired, burnt out exterior. He also beautifully conveys his sorrow that he was once, in younger years, a great friend of Reilly his opponent, and brings out the sense of loss that they have both gone separate ways. Drummond is based upon the famous lawyer Clarence Darrow, the original counsel for defense, who was indeed close friends with the original prosecutor, William Jennings Bryan. It comes as no surprise that Spacey has already played the younger Darrow on television. Mark Dexter is very impressive as the slick and charming lead reporter, E. K. Hornbeck (based on famed journalist H.L. Menken) proving himself the equal of Spacey in plying the audience with witty one liners. As the Scopes character, Bertram Cates, Sam Phillips effectively delineates the struggle to maintain a stand against the community. Sonya Cassidy is similarly quietly intense in portraying the dilemma of Rachel Brown, the minister’s daughter who loves Cates the schoolteacher. Ken Bones is sinisterly oppressive as her father. Nunn has always been adept at large cast plays (he was the original director of ‘Les Miserables’ and ‘Nicholas Nickleby’) and here he is no exception. With a formidable ensemble of actors he creates a living community out of the minor characters. He is also keen to point out the religious sincerity of the townsfolk, even though they are blinkered and stirred up by canting preachers. There is an appreciation of their faith as is evident in the hymn singing which accompanies the scene changes and in the religious meeting which closes the first part of the play. In this world weary age of consumerism and the credit crunch, Lawrence and Lee remind us of the importance of belief and the struggle for truth (in their time under the long shadow of McCarthyism). They are well served by this first rate and finely honed production. Trevor Nunn’s rich revival is a must see!